• Would you like to resolve (and avoid) conflicts with your church’s Staff/Members/Board? • Are members of your congregation looking for a job or a new career? • Is “emotional baggage” hindering the Spiritual Development of your church members? • Are the High School students at your church ready for all the demands of college? INSPIRE Church Consulting’s services go beyond our effective and affordable counseling. Our ministry to churches includes Consultations and Workshops—ideal for growing and sustaining church membership. CrossRoads’ outreach service, INSPIRE Church Solutions, was created by Rev. Dr. R. Benton Ruth from his extensive expertise as a Christian Counselor, Executive Coach, and Pulpit Minister to help your church. Call CrossRoads’ INSPIRE Church Solutions at 317-842-8881 for a FREE, no obligation Pastoral consultation… for INSPIRING results! Rev. 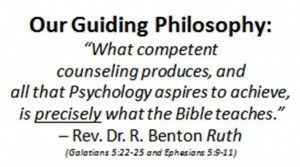 Dr. R. Benton Ruth’s years of experience as a Pastor, Psychotherapist, and Consultant can help you grow and sustain church membership. His first-hand experience with the mental and spiritual demands on clergy workers can help you overcome recurring issues and discover your “blind spots”. Being a servant of the Church does not mean you should suffer! The servant mentality of clergy workers often prevents them from asking for help. Don’t forget–you need to help yourself in order to help not only your church members, but your family members as well. Burnout and co-dependency are common issues for members of the clergy, but it doesn’t have to be that way. A better life awaits. Call CrossRoads’ INSPIRE Church Solutions at 317-842-8881 for a FREE, no obligation Pastoral consultation… for INSPIRING results!